Are you glamourous enough to play this 50 payline 5 reel. 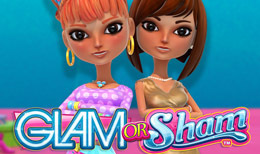 Glam or Sham has glitzy shopping theme perfect for all you shopaholics. Pick up some hot free spins, and Wild bonuses, make sure to keep a look out for the Perfect Outfit ‘Pick Me’ bonus. Without a doubt, Leander Games are longstanding premium quality video slot developers. Although only established in 2008, the have a strong and reliable audience which has enabled them to have a solid grasp on the Latin American online gambling market. This company is most famous for creating LeGa which is a Remote Gaming Server, built to provide in-house and 3rd party games as a way of implementing a social gaming concept, whilst playing with real money. Glam or Sham is just one of their many innovative creations, which is bound to impress! This 5-reel and 50-payline slot-game is themed around fashionable women and their well-groomed pet pooches! These high maintenance women will be your new companion as you proceed through this slot-game to test your luck and fortune! Leander Games has made this slot exclusively to be a high rollers slot machine, where bets start from £50 a spin and go up to £2,500. Therefore, the rewards and prosperities up for grabs in this slot-game are immense and needs to be given a go before being completely discarded by the minimum bet. You are also able to set how many lines out of the 50 you want to play with, so you really can just play with one line if that suits your needs! The symbols on the reels represent the theme of the luxurious lifestyle led by these women, they are: a brunette woman, a red-haired woman, a puppy, a kitten, the Glam or Sham logo, a shopping scene and a feud between two women. The two women will trigger the 500-coin jackpot when you spin 5 of either character, meaning you have twice the chance to strike upon this jackpot! The furry little animals are another focus as they will add a paw-fect 400 coins to your bankroll. The way in which the coin system works is as follows: the prizes of the game are represented in terms of coin values, so the amount that you are awarded with will be reflected with the bet you placed initially. The Glam or Sham logo is the wild feature, which replaces all symbols on the reels, to help accumulate your winning combinations. This makes the above 400 and 500 jackpot bonuses even more luxurious and likely to happen! You will also obtain 10 free spins when you land 3 of the feud symbols anywhere on the reels. One more bonus feature up for grabs involves the shopping scene symbol. No longer fear to have a bad outfit day again, as matching 3 of these symbols unlocks the Perfect Outfit bonus. This bonus enters you into a pick me bonus game and you are asked to continuously click which accumulates cash until you create a matching pair. Although this slot-game won’t cater for a small budget, the amount of bonus features that are up for grabs makes it a very seductive game, and the fact this game offers 10 free spins for landing just 3 of the feud symbols, instead of it having to be 4 or 5 symbols, for us, this makes the game worthy of trying before discarding it completely!